The soda fountain (Diet Coke + Mentos) has been around the net for quite a while with some spectacular videos available, and it has even made it into a news paper cartoon. People go crazy about this and the largest number of simultaneous fountains is steadily increasing. 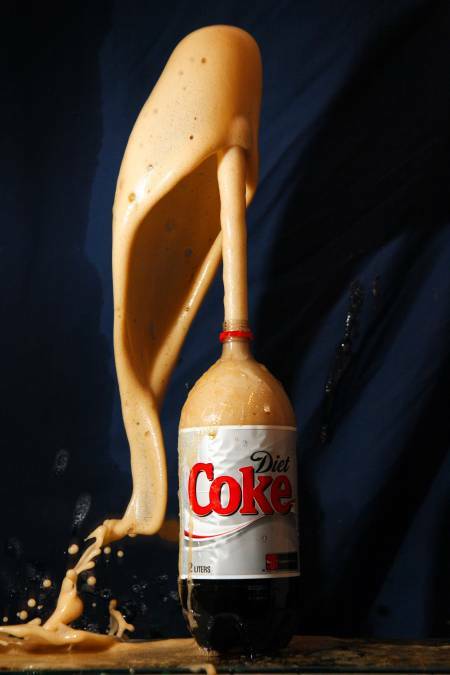 In the paper “Diet Coke and Mentos: What is really behind this physical reaction?” by Tonya Shea Coffey the findings of the Mythbuster teams are largely confirmed. By measuring contact angles it was shown that aspartame and potassium benzoate reduce the surface tension of water. Aspartame is a winner, and as an extra benefit clean up is much easier with Diet Coke than sugared Coke. The amount of caffeine however is too low to have any effect. 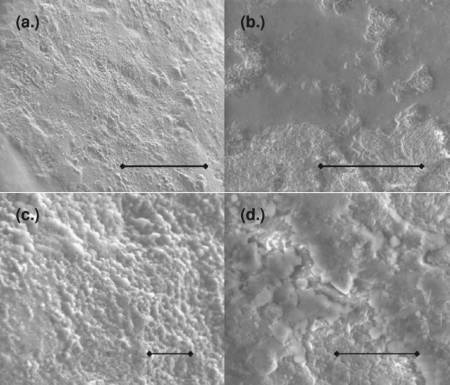 The roughness of the Mentos surface was studied with special microscopes (see picture below). Fruit Mentos have smooth patches, but the coating is not uniform and contrary to the Mythbuster experiment normal Mentos and Fruit Mentos performed equally well with regards to foam formation. The roughness of the Mentos surface was inbetween that of rock salt and the Life savers which suggests that roughness is not a single factor determining the reaction. The Mentos surface is covered with gum arabic which reduces surface tension, and experiments showed that even without Mentos, gum arabic could cause a reaction to occur. It is the combined effects of reduced surface tension (due to ingredients in Diet Coke and Mentos) and the rough surface of Mentos which is the key to understand the reaction. As expected, the article also confirms that the reaction is more vigours at higher temperatures (i.e. solubility of carbon dioxide deacreases with increasing temperature). It was also shown that Mentos sink faster to the bottom of a 2 L bottle compared with rock salt, Wint-O-Green Life savers and sand (this is a function of size and density, not only density). When bubbles are formed at the bottom of the bottle the bubble has more time to grow as it rises. This causes a more explosive reaction and more soda is expelled from the bottle. The question which lingers on my mind is whether Diet Coke and Mentos represent the optimal combination of ingredients to create a soda fountain. With regard to convenience, I guess the answer is yes. But perhaps it’s possible to create an even more powerful reaction? Since lowering the surface tension of water is important, I’m wondering if it would be possible to find a surfactant that could be added without setting the reaction off? Mentos would of course still be needed for the rough surface to provide nucleation sites. In the above mentioned study addition of diluted dish washing liquid was enough to give a pretty good reaction, so this is not an option. But perhaps a couple of drops right on the Mentos surface would work? I definitely need to try this some time.